The Ride the Future recently finished at Google headquarters in Mountain View California after 3,700+ miles from Charleston, South Carolina all while setting 4 Guiness World Records for longest electric vehicle trips for the electric car, electric motorcycle, electric scooter, and electric bike! I had a chance to join the tour for their Flagstaff, Arizona to the Grand Canyon leg of the trip. 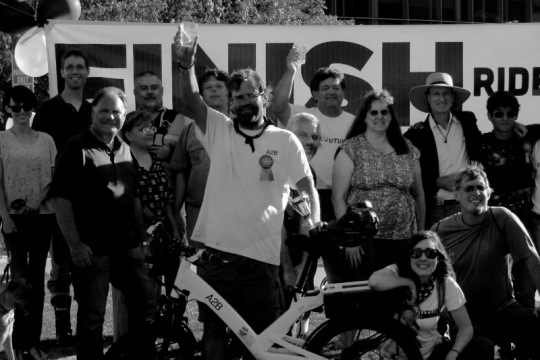 I rode an A2B Metro electric bike with Ben Hopkins who set the Guinness Book of World Records for the longest trip on an electric bike (riding an A2B Alva). Here is a video to give you and idea of what the tour was like. They will be releasing a full documentary film of the full tour soon. Susan Jones is the mastermind behind the tour and I had a chance to catch up with her after this monumental tour. Enjoy this interview with Susan! Pete: Congratulations on a successful tour! 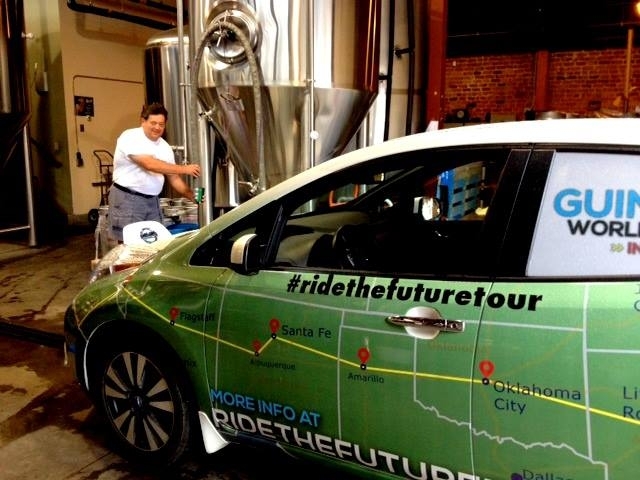 Could you give us some background on how you came up with this idea to do an electric vehicle tour across the US and what the goals were? Susan: My personal goal is to stop gas emissions and help clean up the Earth for our future generations. I started my own electric vehicles company called Xenon Motor Company. Once I saw that Americans were not all jumping at the chance to leave their gas cars in the driveway and get on an electric scooter no matter how much sense it made, I switched gears and started Nashville Scooter Tours. We take tourists on a fully guided 2 hour tour of the city. It was an instant hit. So then I asked myself what else can I do? 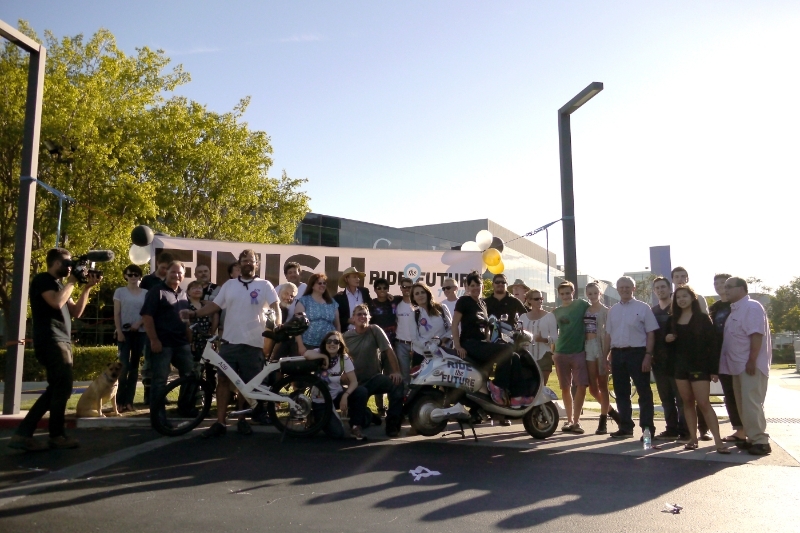 I thought that if I rode my scooter across the US, it would be a good way to make a statement for EVs. I really wasn’t sure if I could make it, but I wanted to at least give it a try. The whole tour grew out of this idea for me to ride my scooter alone. Pete: How did you determine who was going to be the riders/driver in the tour? Susan: The 11 other members who joined the tour just sort of came to me. Duane – who drove the car – I met in a park in Nashville while I was hiking one day. Rachel McCarthy, Ben Hopkins, and Stuart Scott I met while in Bangkok. Jonathan Becker – our filmmaker- I met when I went for a test drive of the Nissan Leaf when they first launched it about 4 yrs ago. 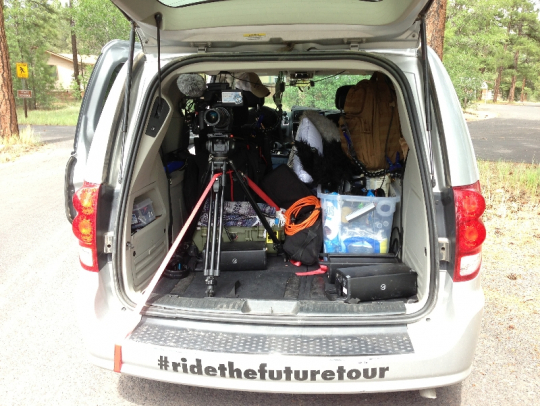 Nissan hired him to document the tour across America. Jonathan hired George Wymenga and Evan Scott to make up our 3 man film and sound crew. One member was my 26 year old daughter, Dominique Arciero. We put her in charge of the music entertainment at our nightly town parties since she’s a professional musician. Our boy wonder, Sean Scott, from Hawaii, was brought on by his dad Stuart. 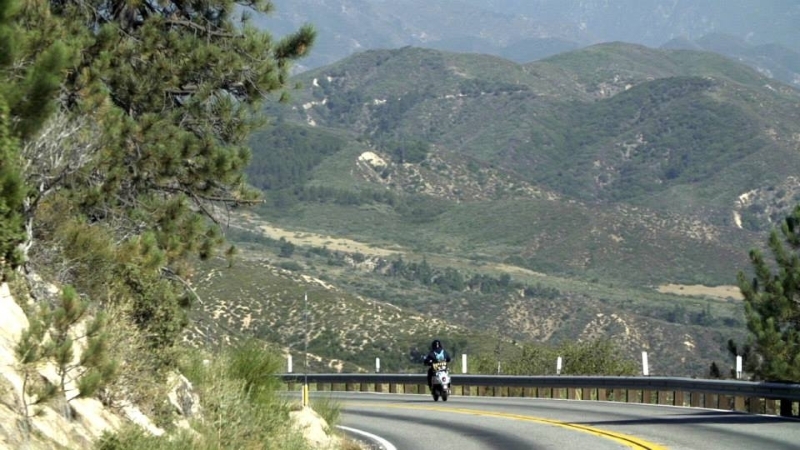 And lastly, I found Ben Rich who rode the electric motorcycle on Facebook. Pete: How did you determine the route for the tour? Susan: Our route across America was pretty much laid out for us. I knew I wanted to start in Charleston, SC because it would be beautiful for the documentary. Then we mapped straight across the US as much as possible with little detouring. Then we made our cities about 100 miles apart because of the range of the electric car. These parameters dictated our trek for the most part. 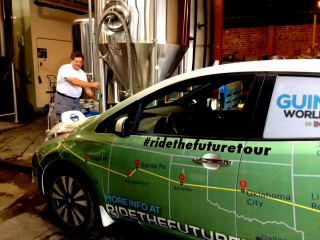 Pete: What kind of electric vehicles were in the tour? 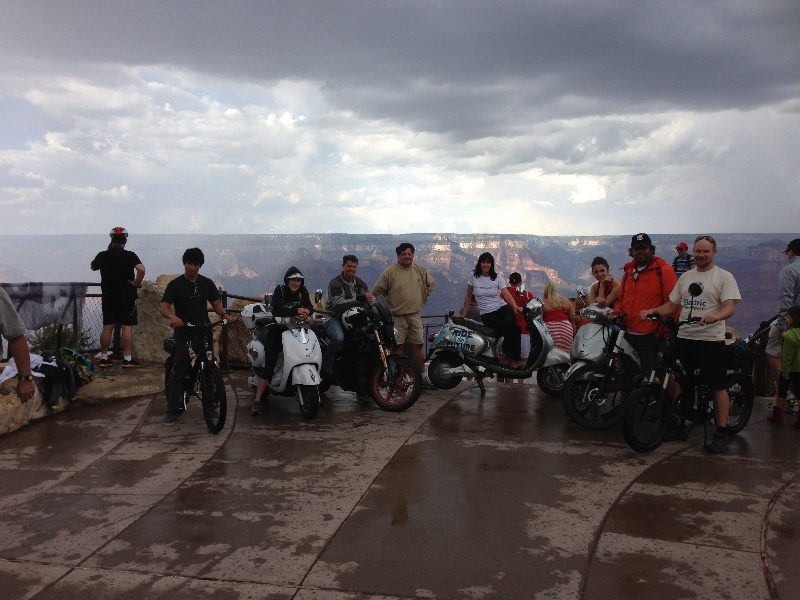 Susan: On the tour we had the electric car, electric motorcycle, electric scooter, and electric bicycle. Pete: What was the most memorable experience from the tour? 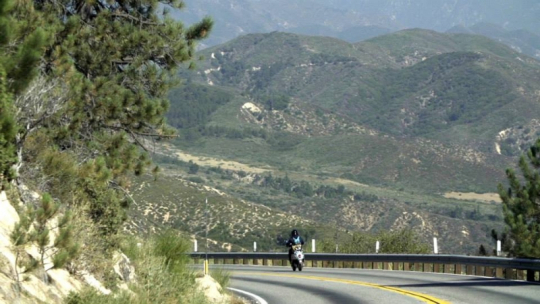 Susan: The most memorable experience of the tour was riding my scooter down the mountain as we left Big Bear Lake,CA. I’ve seen a lot of beauty in a lot of countries but these views were spectacular like I have never seen before. And the ride down that mountain is an experience I will never forget. Scary but spectacular. Pete: Who was the most memorable person you met along the way? Susan: Angel. 90 something yrs old. The man known for keeping Route 66 alive with his store and barbershop. He is a virtual warehouse of wisdom and I was so fortunate to have met him. I can’t wait for the world to meet this special human in our documentary. Pete: What was the craziest thing that happened? Susan: The craziest thing that happened to me on the tour was the day we left Las Vegas, NV. I was supposed to wait for the film crew van and ride along with them as my support because it was a very dangerous ride and I was going to ride alone that day. We would be in the desert with extremely high temperatures and would not be able to rely on stores and shade and other people. It turned out that the film crew needed to change our plan and I would head out alone. I headed out but I couldn’t find the small streets that Duane sent out in our nightly email for the next day’s trek. I got frustrated and jumped on the freeway thinking at least I can’t get lost and won’t be alone. 30 seconds later a cop pulled me over and insisted I get off and take an off highway route. So my 89 mi trek became a 139 mi trek in 110 degree heat through the desert all by myself. I was armed with extra batteries and a charger so I eventually, just as the sun set and it got dark, rolled into the hotel in our next city. What began as my scariest moment on the tour became the most memorable. The vast openness, dead silence, not a soul in sight, and facing my fears made the ride that day unforgettable for as long as l live. It was the most beautiful day of all 44. Pete: Did you have a lot of interest from people you met on the road and at presentations? Susan: We didn’t have large numbers of people flocking to our town parties but the groups that did come out were so great. They loved what we were doing and were so eager to hear more about our journey and electric vehicles. It was nice to be able to sit and chat with people from all walks of life and get a snapshot into their life – and them into mine. Pete: How was the finale at Google Headquarters? Was there a lot of interest from Google employees? 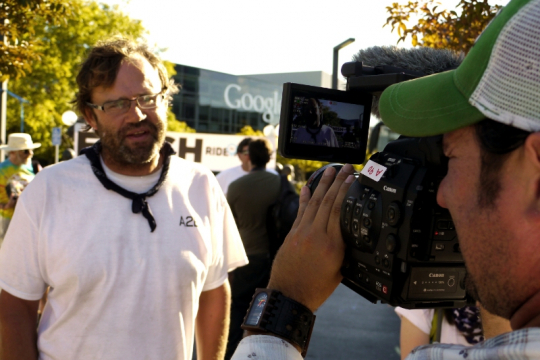 Susan: I had no idea Google would turn out to be such a fantastic finish line. I simply wanted to thank them for everything they create for us. 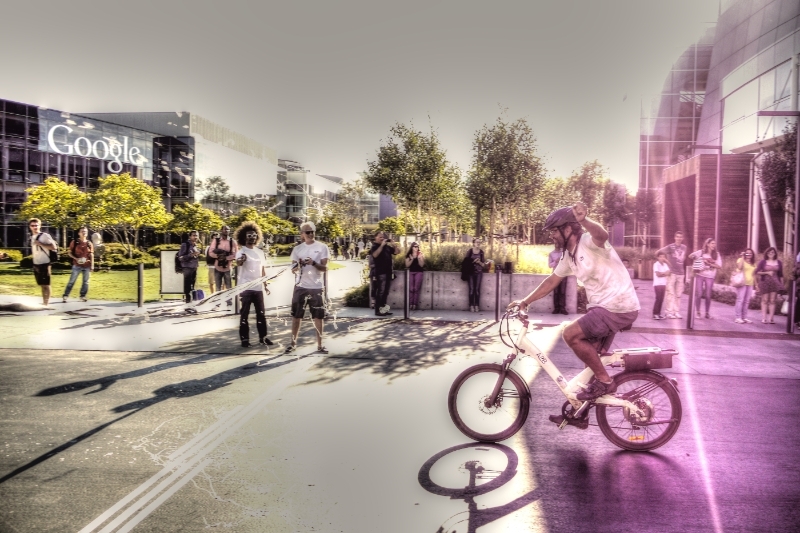 As it turned out the Google campus was teaming with people riding the Google bikes, strolling around, hanging out enjoying the gorgeous day. It was a built in crowd for our final scene of our movie. Our people all turned out but it was even more perfect with the buzz of the Google HQ folks. It couldn’t have been better !! 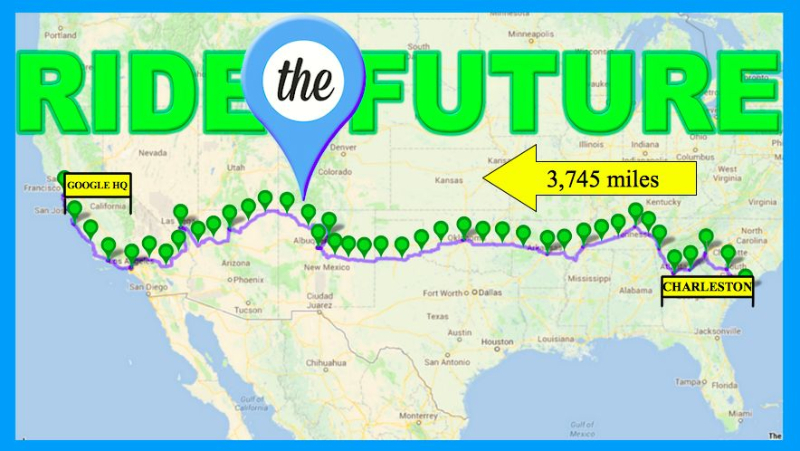 Pete: This was Ben Hopkins first time to the US and he road his A2B Alva 3,700+ miles and set a Guinness Book of World Record for the journey. That is an impressive way to see the US for the first time! How is Ben doing after that monumental ride? Susan: As it turned out the mileage was more like 4400 miles. I haven’t even spoken to Ben once since he’s been back to Bangkok. I’m good friends with his wife and she has been sending me reports. He’s telling her stories non stop. She just sits and listens for hours soaking it all up. Pete: You had a professional film crew recording a lot of the action on the road and when you gave presentations in local towns and cities. When can we expect to see the documentary film about RTFT and where will we be able to see it? Susan: We hope the editing of our documentary will be completed by November of this year. We would like to submit it for the film festivals as well as make the DVD available. At some point we will also make a 10 episode version showing all the entertaining people we interviewed along the way, more of the 12 tour members’ daily experiences, and lots more footage of America. Pete: Now that the dust has settled a little, do you feel that the tour was as successful as you wanted it to be? Is there anything you would change if you were to do it over again? 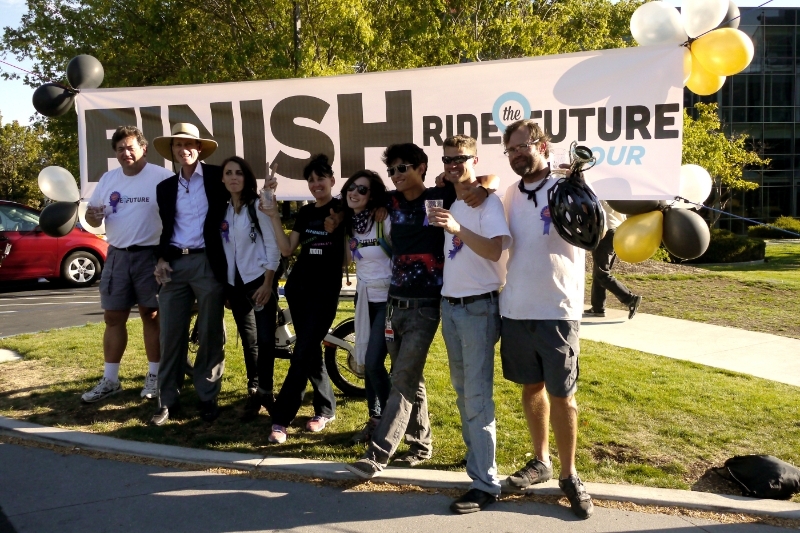 Susan: I feel like the tour was a complete success because we finished the entire trek on our EVs on time and made a documentary to commemorate the event. If we were able to positively influence others to trust EVs the way we do, then all the better. The one thing I would change next time is how I handle a group of 12 adults. I was real big on giving everyone a say and letting everyone express themselves. That just doesn’t work in every situation. Sometimes it’s a recipe for disaster. So next time I’ll just have to be more comfortable with telling people exactly how it’s going to be. Not my style! But things will run a lot smoother. Pete: Do you have plans to do this tour again? Or maybe a different tour? 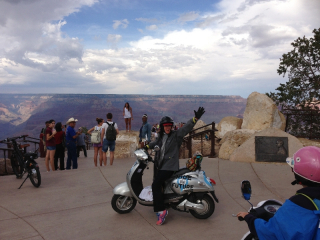 Susan: I am contemplating making another Ride The Future Tour in 2014 through SE Asia. We would start up in Hanoi, Vietnam and end in Singapore. This would be a beautiful ride and an amazing documentary. I would love for the world to see Vietnam the way I’ve seen it. Cambodia and Laos are fascinating. Thailand is full of beautiful untouched countryside with the sweetest people. The longer distance version would include Burma. Google HQ in Singapore would be the grand Finish Line. If all the necessary components come together then this will be my next adventure and documentary. I would like to thank Susan for her time and having me join in on some of the RTFT adventures. The Ride the Future Tour was great and I personally look forward to RTFT 2014! If you have any questions or comments for Susan, please leave them in the comments section below. You were doing 100 miles a day. 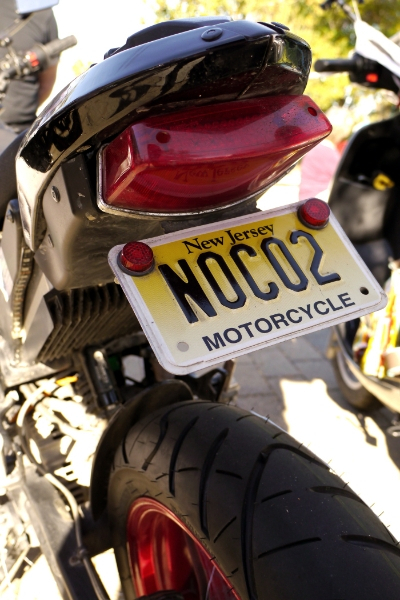 How and where did the bike get charged? The Nissan Leaf carried extra e-bike batteries and they would swap out batteries every 20-30 miles.